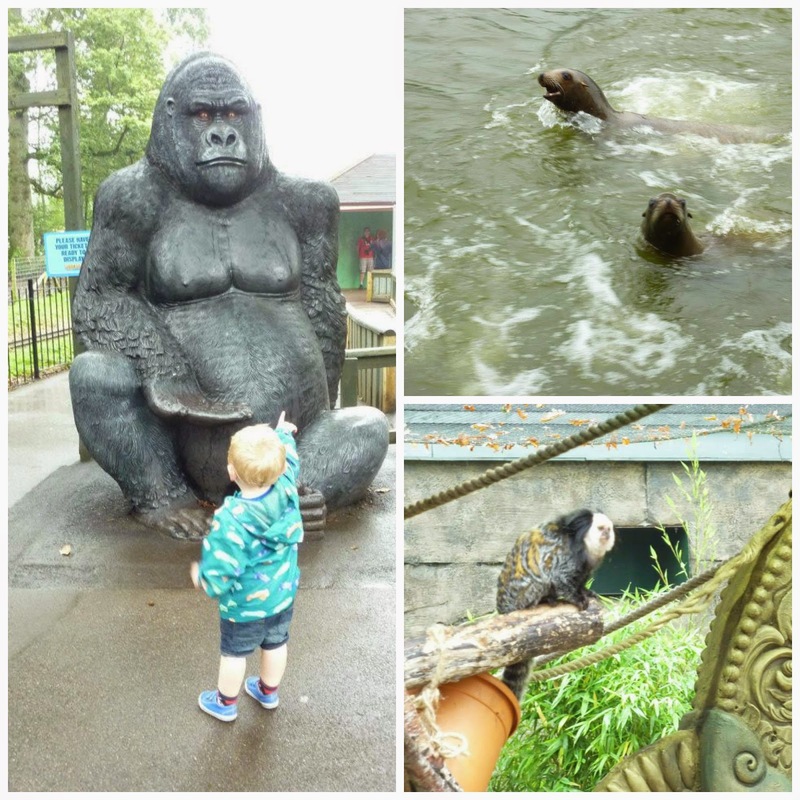 Entertaining Elliot: Lots of fun at Longleat Safari & Adventure Park! On the way to Longleat, we did briefly wonder if we should have stayed at home because the weather was pretty bad!! On the way there we had thick fog and drizzle so not the best driving conditions. Luckily once we'd arrived it did clear up and we needn't have worried! 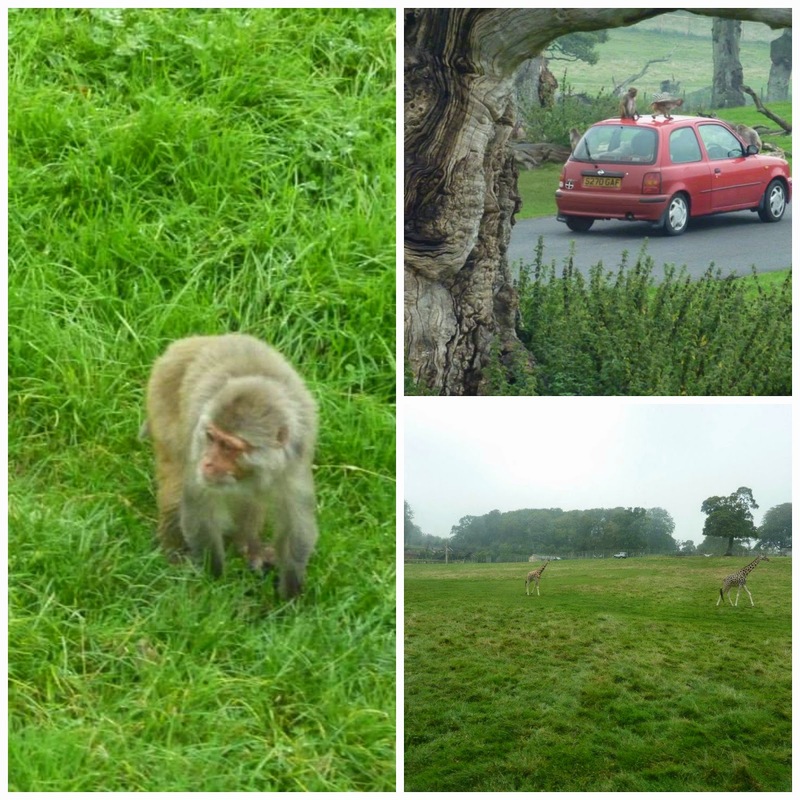 The last time I visited Longleat was way back before I was married (12+ years ago!) so things have moved on alot since then with lots more to see and do. The park is split into two with the Safari Park featuring all the big names like lions, tigers, giraffes, even an elephant. The other section, the Adventure Park is where you'll find all the smaller attractions like the meercats, the giftshops, Postman Pat Village and loads more. As we visited on a weekday, the park was lovely and quiet, It was great to be able to take our time and not feel rushed - especially important with toddlers who work on their own time scale!! We began our day at Jungle Kingdom and it was brilliant to see the animals close up. Loved the little monkeys in the Monkey Temple! Lots of creatures to see here including prickly porcupines, rainbow lorikeets, ferrets and chipmunks. Jungle Kingdom is also home to the most dangerous animals in the park - hippos! We hopped on the boat which took us on a lovely cruise round the lake - unfortunately the hippos were no where to be seen but who can blame them with the weather we had. Bet they were tucked up nicely in their mud bed! We cruised past Gorilla Island where we spotted Nico who is a very elderly silverback gorilla. He's got all the mod cons on his island including satellite tv!! We also spotted a couple more gorillas relaxing outside their lakeside home, Gorilla Colony. As the boat travelled round the lake we were joined by some hungry sealions. You can purchase a pot of fish onboard for £1 to feed the sealions although we didn't do this - Elliot would probably tried to eat the fish!! Next up was Penguin Island where you can walk amongst the penguins in a fancy new outdoor walk-through. 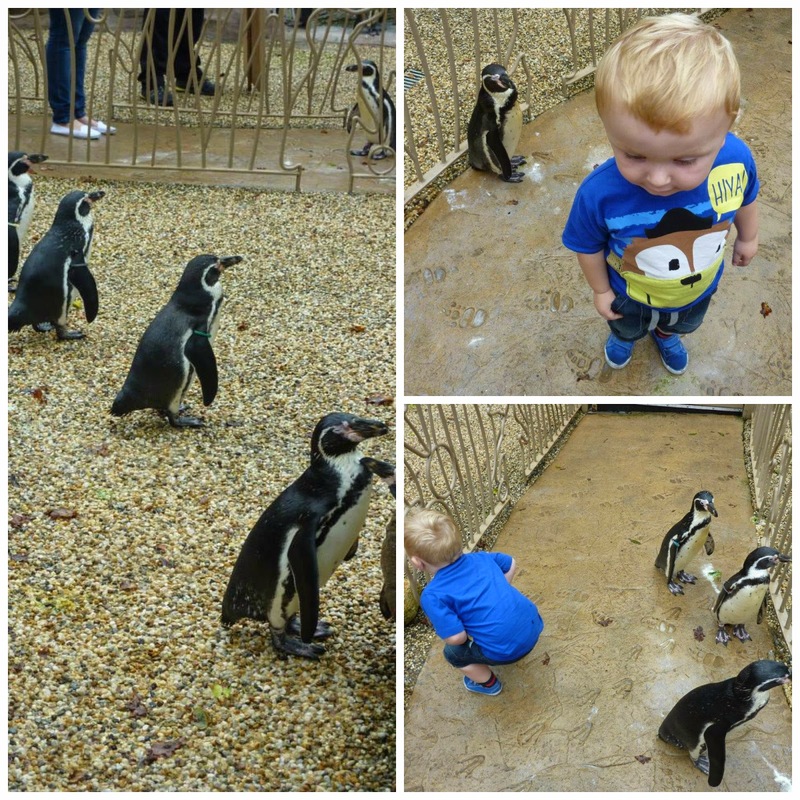 The toddlers thought this was great and I don't think they could quite believe their eyes that penguins were stood right next to them!! You can also watch the penguins swimming in their subterranean cave - we didn't linger in here as it was a bit too stinky!! The kids were getting a bit hungry by this point so we decided to find somewhere to have some lunch. There are quite a few eateries at Longleat but we had a packed lunch, the tricky bit was finding somewhere dry to eat! We sat down on our buggy covers in the end but I think some under cover picnic seating is needed here. After lunch we went to say hello to the meercats and my friend was very very excited about this!! They have a special walkway where the path leads right through their enclosure. The meetcats have lots of space to run around and it's funny to see them dashing right in front of you across the path! Elliot and his friend Maddison loved the meercats and I think they would have smuggled one out if they'd had the chance!! Next it was time to visit the Safari Park which we were very excited about. I wasn't however too keen on the idea of driving my car around - I'm not sure my husband would have forgiven me if I'd taken the car through the monkey bit!!! Fortunately Longleat have this covered and if you do want to leave the park with your windscreen wipers intact then you can go on the Safari Bus! It's £4 per person (3+) and it takes you right round the safari taking around an hour and a half. It's very popular so I would recommend booking your ticket as soon as you get to Longleat otherwise you might not get a seat. We had seats on the upper level of the bus and we had great views across the park. First stop was the African Village where you come face to face with the giraffes. There's plenty of viewing platforms and you are literally a few metres away from these beautiful creatures. Also at the African Village you can see zebras and lemurs. We only had a short time here so didn't get to see the lemurs up close but they have an impressive walkthrough where you can wander amongst them. The safari bus then drove on through the park and we saw the keepers replenishing the giraffes food....the giraffes also noticed this because they all started to amble across the grass towards them! The monkeys were up next and they were so cheeky! There was a car behind our bus and within minutes his car was covered in monkeys and they were having a whale of a time pulling things off the car!! Unfortunately Elliot started to flag at this point and before I knew it, he was sound asleep on my shoulder - what a pity, he was about to sleep through the best part of the safari, the big cats! 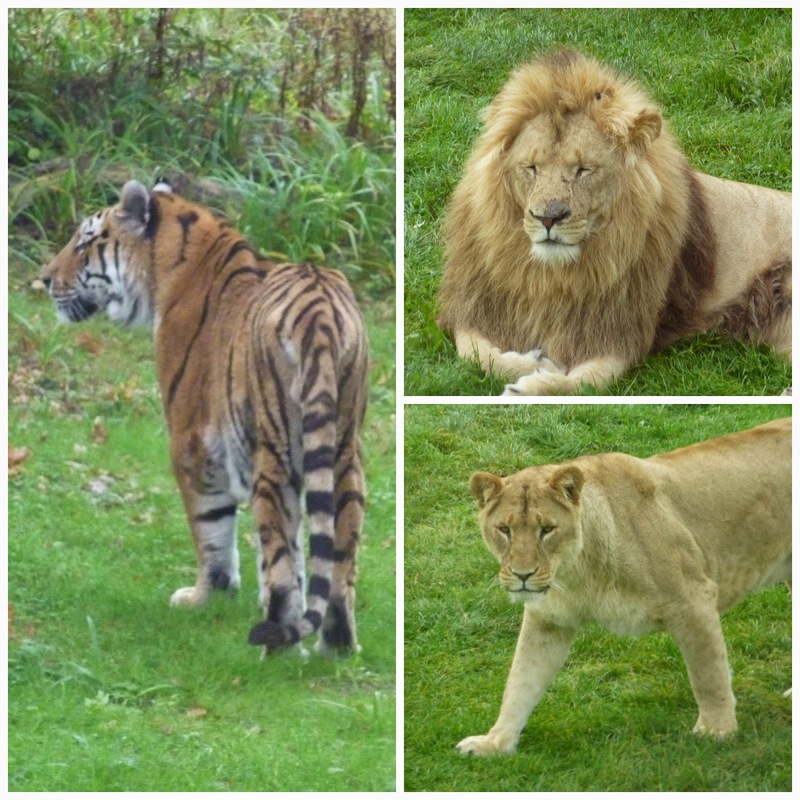 Longleat is home to several lion prides and it was amazing to see them up close. The lion cubs are very very cute! I'd be here forever if I wrote about all the animals we spotted on the safari tour but highlights included the rhinos, bongoes, camels (what a strange looking animal! ), wolves and the majestic tigers. We were also lucky enough to spot Anne the elephant venturing out of her enclosure. Anne is a rescue elephant and was very badly treated at her previous home, a circus. Longleat have taken great care to look after Anne and are building her an amazing new £1.2million home at the moment. We had just enough time for a quick ice cream stop and a look round Postman Pat's village before the obligatory gift shop visit!